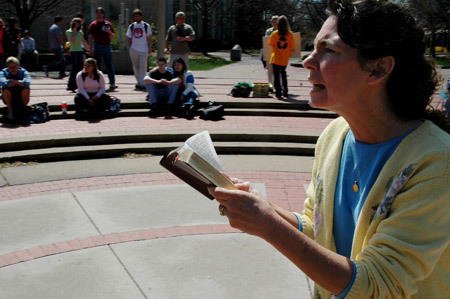 "Sister" Cindy Smock reads a Bible verse to students gathered at Speaker's Circle on the University of Missouri Campus. Cindy became a Christian after hearing "Brother" Jed speak at the University of Florida. She initially mocked Jed, who then told her to "Repent of your sins, you wicked woman." Cindy, who was studying journalism, quit school and began travelling and preaching. She and Jed were married five years later. 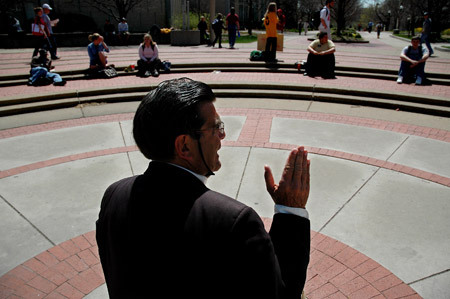 Jed Smock was formerly a university professor, but left the classrooms to preach open-air to college students. Jed said he was confronted by a Middle-Eastern man carrying a cross while living on a hippy commune in Morocco more than 30 years ago. He has been travelling the country ever since, trying to save the sinners who are attracted to his preaching by his confrontational style of arguing with students and telling them they are all going to Hell.